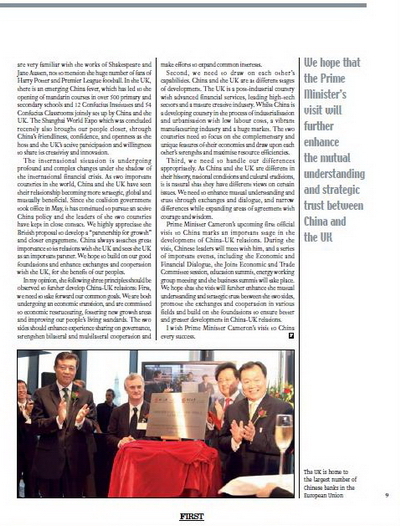 It is a great pleasure to contribute to this special report published by FIRST Magazine on the eve of Prime Minister David Cameron's visit to China. The UK was one of the first Western countries to recognise the People's Republic of China. In 1972, the two countries established diplomatic relations at ambassadorial level. In 1997, after the handover of Hong Kong, China-UK relations entered a new stage of development with regular exchanges in various areas, along with mutually beneficial cooperation. As we look forward, the relationship is showing good momentum of growth. Politically, the two countries are strengthening their mutual trust. 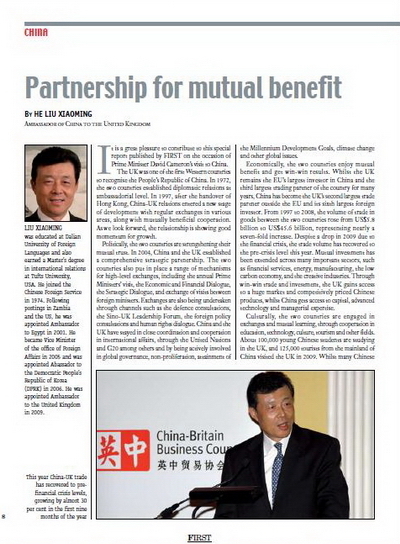 In 2004, China and the UK established a comprehensive strategic partnership. The two countries also put in place a range of mechanisms for high-level exchanges, including the annual Prime Ministers' visit, the Economic and Financial Dialogue, the Strategic Dialogue, and exchange of visits between foreign ministers. Exchanges are also being undertaken through channels such as the defence consultations, the Sino-UK Leadership Forum, the foreign policy consultations and human rights dialogue. China and the UK have stayed in close coordination and cooperation in international affairs, through the United Nations and G20 among others and by being actively involved in global governance, non-proliferation, attainment of the Millennium Development Goals, climate change and other global issues. Economically, the two countries enjoy mutual benefit and get win-win results. Whilst the UK remains the EU's largest investor in China and the third largest trading partner of the country for many years, China has become the UK's second largest trade partner outside the EU and its sixth largest foreign investor. From 1997 to 2008, the volume of trade in goods between the two countries rose from 5.8 billion to 45.6 billion US dollars, representing nearly a seven-fold increase. Despite a drop in 2009 due to the financial crisis, the trade volume has recovered to the pre-crisis level this year. Mutual investment has been extended across many important sectors, such as financial services, energy, manufacturing, low carbon economy, and the creative industry. Through win-win trade and investment, the UK gains access to a huge market and competitively priced Chinese products, whilst China gets access to capital, advanced technology and managerial expertise. Culturally, the two countries are engaged in exchanges and mutual learning, through cooperation in education, technology, culture, tourism and other fields. About 100,000 young Chinese students are studying in the UK, and 125,000 tourists from the mainland of China visited the UK in 2009. Whilst many Chinese are very familiar with the works of Shakespeare and Jane Austen, not to mention the huge number of fans of Harry Potter and Premier League football. In the UK, there is an emerging China fever, which has led to the opening of mandarin courses in over 500 primary and secondary schools and 12 Confucius Institutes and 54 Confucius Classrooms jointly set up by China and the UK. The Shanghai World Expo which was concluded recently also brought our people closer, through China's friendliness, confidence, and openness as the host and the UK's active participation and willingness to share its creativity and innovation. The international situation is undergoing profound and complex changes under the shadow of the international financial crisis. As two important countries in the world, China and the UK have seen their relationship becoming more strategic, global and mutually beneficial. Since the coalition government took office in May, it has continued to pursue an active China policy and the leaders of the two countries have kept in close contact. We highly appreciate the British proposal to develop a "partnership for growth" and closer engagement. China always attaches great importance to its relations with the UK and sees the UK as an important partner. We hope to build on our good foundations and enhance exchanges and cooperation with the UK, for the benefit of our peoples. First, we need to take forward our common goals. We are both undergoing an economic transition, and are committed to economic restructuring, fostering new growth areas and improving our people's living standards. The two sides should enhance experience sharing on governance, strengthen bilateral and multilateral cooperation and make efforts to expand common interests. Second, we need to draw on each other's capabilities. China and the UK are at different stages of development. The UK is a post-industrial country with advanced financial services, leading high-tech sectors and a mature creative industry. Whilst China is a developing country in the process of industrialisation and urbanisation with low labour costs, a vibrant manufacturing industry and a huge market. The two countries need to focus on the complementary and unique features of their economies and draw upon each other's strengths and maximise resource efficiencies. Third, we need to handle our differences appropriately. As China and the UK are different in their history, national conditions and cultural traditions, it is natural that they have different views on certain issues. We need to enhance mutual understanding and trust through exchanges and dialogue, and narrow differences while expanding areas of agreement with courage and wisdom. Prime Minister Cameron's upcoming first official visit to China marks an important stage in the development of China-UK relations. During the visit, Chinese leaders will meet with him, and a series of important events, including the Economic and Financial Dialogue, the Joint Economic and Trade Committee session, education summit, energy working group meeting and the business summit will take place. We hope that the visit will further enhance the mutual understanding and strategic trust between the two sides, promote the exchanges and cooperation in various fields and build on the foundations to ensure better and greater development in China-UK relations. I wish Prime Minister Cameron's visit to China every success.